Although you can practice any way you want, the best way to practice taiji or qigong is in a group. It does not matter how big the group is; what does matter is if the group energy is together or in sync when everyone goes the same speed and same direction. 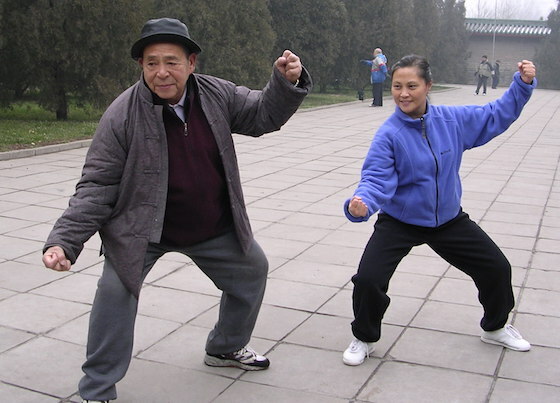 In old Chinese tradition, the group energy is very often emphasized. In ancient Chinese healing, each individual has energy channels. If the channels are open in one person, it affects another person in the same room. If the channels are open in many individuals, the energy in the room can really be felt. If one person's channels are open and another person's are not, sooner or later that person's channel will be opened as the practice proceeds. You can feel the energy when you practice with a person who has a high energy level and smooth flow of energy through his or her channels. Our students always feel good after practicing taiji in the classroom with other people. Sometimes you may also be able to tell when someone has too much negative energy. It makes you want to avoid them. But if this person continues to practice taiji or qigong faithfully, his or her energy may change, and you may feel the difference after a while. I have seen this happen in many students. This brings up an idea I would like to express: People do change and people can change. Developing taiji discipline is very important in taiji practice. It is not easy. It takes effort and mind power. Unlike other exercises such as walking, weightlifting, and running on a treadmill, you don't need memory to walk, to lift weights, or use a treadmill. These are all external body workouts not necessarily involving the mind. Taiji and qigong are different. It takes a special person to practice them. Why? First, it is an internal workout where the effort required cannot be seen. Most people, when they learn how much effort is involved, won't take up the challenge. Second, it takes time to learn and practice. Not many people are willing to take the time to learn something difficult that has no monetary reward. Third, it is not a mainstream exercise, so most people go with the crowd and do what other people do. Fourth, the majority of people like to do things fast, not slow. They feel that doing things slowly is a waste of time. Last, the majority of people don't have discipline. Only special people have discipline. Nothing comes easily. Nothing comes overnight. Being frustrated can only get you down and make you uncomfortable. Learning taiji is a journey of natural healing; it takes time. There are no shortcuts to learn taiji or qigong. If you don't get it right this week, maybe you will next week, or the next month, or the next year—it doesn't matter how long it takes. Many people think that learning the form is all there is to taiji study. To learn a taiji form is not that difficult. To learn how to do it correctly is difficult. It can take a very long time. The taiji form is not really that important. It just gives you a tool for working with your qi. You can use this tool correctly or incorrectly. The correct way to use this tool is to pursue real taiji skill. The incorrect way to use this tool is to show off taiji moves without building a strong foundation. Showing off will only keep you away from being a good taiji practitioner. If you want to do it the correct way, you should be prepared for a long journey. When it's time to show your taiji skill, your performance of the form will be beautiful and filled with qi. If you want to see the breathtaking view from the top of a mountain, you have to plan a trip and make the hike. This can be hard work, but there is a great payoff that makes it worthwhile. Many taiji masters in China have studied for a lifetime and still practice regularly. In Chinese martial arts, there are no belts awarded. The reward is inside the practitioner. When it is time for a real fight or competitive tournament, you can see their genuine skills. Some people look for shortcuts to success. However, there are no shortcuts. Just like anything else in life, hard work and a solid foundation will allow you to reach higher levels of achievement and build a better character. Trying to find a shortcut is shallow, superficial, and doesn't let us solve real problems. Only real skills acquired through learning and practicing can solve real problems. In the beginning of my teaching, I went to Beijing to be mentored by Master Feng Zhi Qiang. I thought I did well performing in front of Master Feng. But all he said to me was "Too tight, too tight." That was a big lesson for me. After that, I really began to focus on relaxation in my practice. I can feel the benefits. I also realized that relaxation must come from within. You must have confidence in yourself. No one is born with skill. But it is really true that you can do anything if you put your mind to it. People have different strengths and weaknesses—nobody is perfect. Everyone has different experience. Some people learn certain things more quickly than others. However, everyone can learn if they choose to, have enough determination, and engage their mind fully in the learning process. Just like when you go to college, you will graduate if you choose to graduate—and you will drop out if you choose to drop out. If you commit to using taiji to enrich your life, stay healthy, create a harmonious life, and learn the science of human energy, you will learn it very well. Even though you may feel uncoordinated in the beginning, sooner or later you will feel much better. Your confidence will increase each day. A positive attitude is important for everything. You will not succeed if you have a negative attitude. This is also true of taiji. You may choose to do some other physical activity or exercise, which can also give you benefits. With anything you want to learn, you should always keep a positive attitude. Sometimes you might have a negative experience, but this is no reason to be negative. I asked a patient to study taiji for stress relief. She tried one class and said she hated it. It was a very negative thing to say. I asked her why she hated taiji, and she responded that the instructor made her uncomfortable. She did not think she could learn taiji, so she quit. After I explained what taiji is and how to practice, she decided to try again and did much better. Like everything else in life, practice makes perfect. Learning taiji is the same: without diligent practice, you will not develop taiji skill or reach higher levels. A doctor graduated from medical school and got his license, then started his medical practice. Another doctor has been practicing medicine for more than ten years. Who would you choose to be your doctor? What if you need a service from a company—would you choose a new company or a well-known company that has been providing the service for many years? Remember, good skill comes from diligent practice. The practice of taiji should be fun, not a chore. If you think it is fun, you will practice regularly. If you think it is work, you may not do it. The above is an excerpt from Tai Chi in 10 Weeks: Beginner's Guide, A Proven Step-by-Step Plan for Integrating the Physical and Psychological Benefits of Tai Chi into your Life by Dr. Aihan Kuhn, DIPL, OBT.